You can currently Enter to win a $100 Target Gift Card from Care.com! 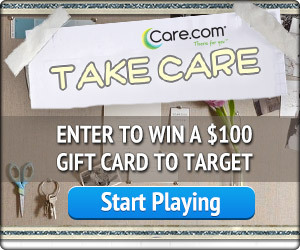 Play the Take Care Challenge and you can be entered to win a $100 Target Gift Card! If you need a babysitter or any kind of caregiver, Care.com is the place to look! You can take a crash course in Babysitting 101 and find out what kind of caregiving best suits you. You may be surprised to find out!